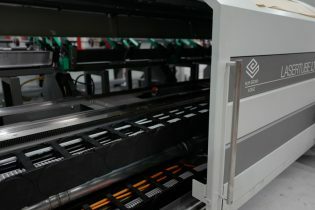 Meet our brand new LT7 Lasertube cutter. Installed this week in our Machine Shop, this substantial piece of kit heralds a significant leap in our lasertube capability and productivity. It’s also a significant investment, another step in our far-reaching plan to grow and develop each of our different specialist workshops. This new machine is pretty awesome. It’s fast, accurate, flexible and consistent, bringing a wealth of extras and refinements. 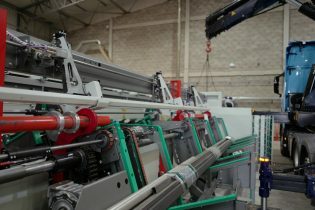 Fully automated, the LT7 works at a broader range and can be programmed to cut special shaped tubes and open sections, not just the usual round, square or rectangular tubes. It can load single bars or batches; dynamically nests parts to minimise waste; actively marks parts with sequential numbers or part ID; and has multiple unloading positions. And at the end of each production batch, it reconfigures itself ready for the next. For our clients, this makes for a faster turnaround on complex or multiple components for their projects but with absolutely no compromise on accuracy. For us, the speed, precision and reliability of the LT7 makes the kit we manufacture in-house even better. Watch the LT7 in action.